Catios are easy to imagine when there’s a big back yard for cats to enjoy, but what about living in the city? Urban cats love the wind in their whiskers too, but limited outdoor space and sheer height can be a challenge. That’s why it’s my absolute pleasure to share with you a few urban deck catios, including DIY and custom projects, all created for feline and human enjoyment in the big city. These exciting neighborhoods and homes brought unique opportunities that were fun to design. Take a look at three different families that maximized the minimal outdoor space to give their city cats a taste of the sweet outdoors. 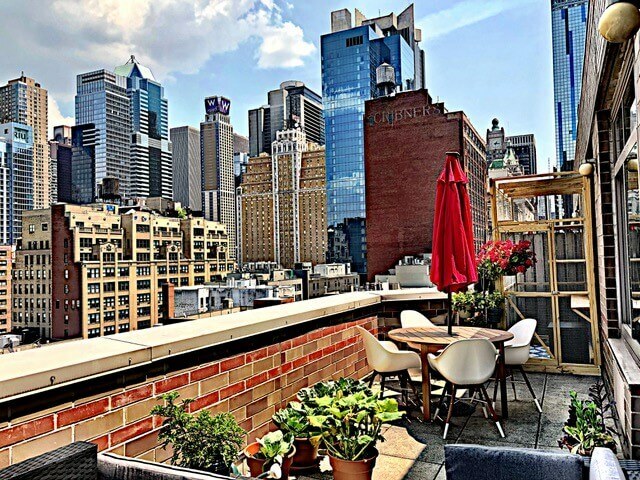 Incredible view of NYC from Mask and Tuli’s catio terrace. NYC actress, director and producer Paula Rossman purchased our 4 x 8 Haven DIY Catio Plan for her two rescues: Mask, a cuddly lap hog who’s approximately 10 years old and Tuli, a constantly hungry and trouble-making 5-year-old who pretends he’s an alpha (Paula says he’s really not). Tuli enjoys views of the bustling streets of New York. Mask was adopted in 2007 (along with cat brother Phantom) when Paula lived in Florida. The duo were indoor/outdoor cats until, unfortunately, Phantom was taken by a hawk. Paula adopted Tuli and they lived in a one bedroom apartment until moving into a new place in New York with a terrace! The catio is Tuli’s first experience being outdoors and Mask’s first time back outdoors since losing Phantom. Outside the catio, plants add a touch of nature to an otherwise concrete cityscape. 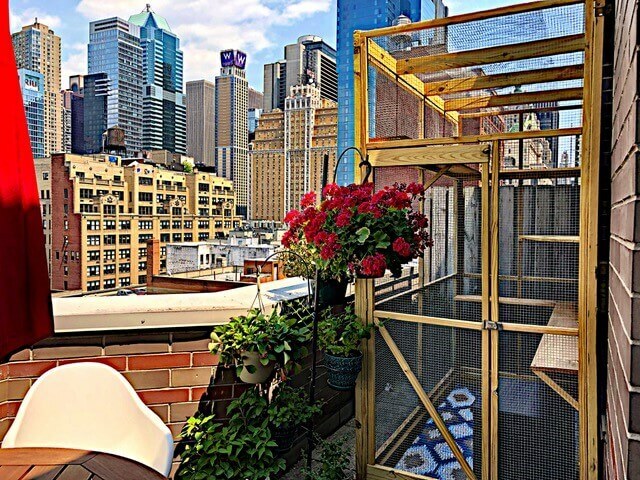 Due to conditions of her rental lease, Paula found smart, functional ways to adapt the Haven DIY plan for her NYC terrace. Adding a vertical window cat door gives her kitties easy access into the catio—Paula’s dog Rosie has found her way through the cat door and into the catio, too! Catio Spaces: Why did you want a catio? Paula: So my kitties could safely enjoy the outdoors. I hired a local carpenter to build the DIY plan and the catio allows my cats the freedom to go outside and enjoy the additional living space. CS: How has life changed since having a catio? Paula: They use the outdoor litter box as much if not more than the indoor one…makes it easier to control “cat odors” inside! (That will likely switch back in the middle of winter, I imagine!!) They seem happier, too. More content. CS: How are your cats acclimating to catio life? Favorite spots, time of day, moments in the catio? Paula: It depends on how hot it is, of course…they seem to really like early mornings, later in the afternoons and at night. Christina Shires and husband Kevin asked us to custom design a deck catio to complement their unique three-level live/work townhome in Seattle. 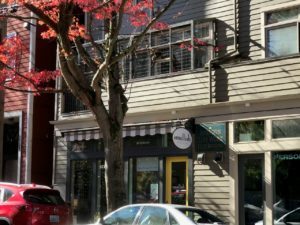 The street-level floor is Christina’s photography business Smallish Photo Studio, and the family inhabits the top two floors. As common in urban environments, their townhome has no yard and only a small balcony for access to the outdoors. Using the second-story balcony as the foundation, my Catio Spaces team and I set out to build a custom catio outside the living room of their townhome. Cat parents Christina and Kevin enjoy catio life with curious Finnegan and sweet Fanta. The catio features vertical movement for the cats with shelves and carpeted corner lounging areas. At 4’ x 16’ long, half the catio roof is covered with polycarbonate and the other half consists of a wire mesh roof. Tabbies Finnegan and Fanta have plenty of territory to explore while watching birds in the tree outside their catio and the bustle of the urban neighborhood below. Watch Fanta and Finnegan enjoying the “high life” in their urban deck catio. Christina: I’m a fairly new “cat person.” Finnegan was my first cat, and first-ever pet. Not long after bringing him home, it became apparent to me that he had a lot more energy and intrigue than could be satisfied by being inside all the time. I did a fair bit of research on the idea of letting him be an indoor/outdoor cat but was pretty convinced that being outside had more cons than pros. Still, I felt guilty by how restless and bored he was inside. Ultimately, I feel as though a lot has been taken away from domesticated cats. Their instincts to stalk and hunt and play and jump and run are often not satisfied by an indoor life. As much as I would try to play with Finnegan, he seemed to still have an insatiable energy. I started putting him on a leash and taking him outside to quiet parks and alley ways where he wouldn’t be too frightened but he didn’t always seem to enjoy this, and if I’m being honest, walking a cat is a boring, tiresome activity! Around this time, I started eyeing our balcony. It had become a “storage” (i.e. junk collecting) space for us and was a bit of an eyesore. The more I looked at it, I realized it would be a perfect outdoor space for Finnegan and our new little furball, Fanta. CS: How have the cats responded to having a catio? Christina: They love the catio. It gives me such satisfaction to see them jumping from shelf to shelf, sunning themselves way up high, chasing bugs and light patterns on the wall, and this time of year, chasing falling leaves. They both love to sit up high, especially on sunny days. It’s fun to watch them observe from above the urban busyness below: bus lines, cars, people, kids, dogs, birds, etc. Their lives are so much richer! CS: How has your life has changed since having a catio? Christina: Our balcony wasn’t anything special before but now it’s so much improved. It’s hard to describe but it looks more sophisticated and cool now! 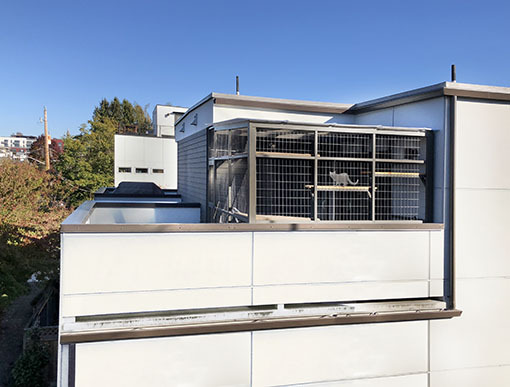 The materials that were used by Catio Spaces match the look of our building—it looks high quality, unique and urban! I’m so glad we invested in the catio. We’ve had it a week and it’s already worth every penny. We’re brainstorming now about adding a chair or two for us to sit outside, an outdoor rug, plants and white lights. We can’t wait to make it an even cooler space for us and the cats! Software engineer Tamar Goldberg asked us to design a catio for her and her two kitties Dorian and Willow. 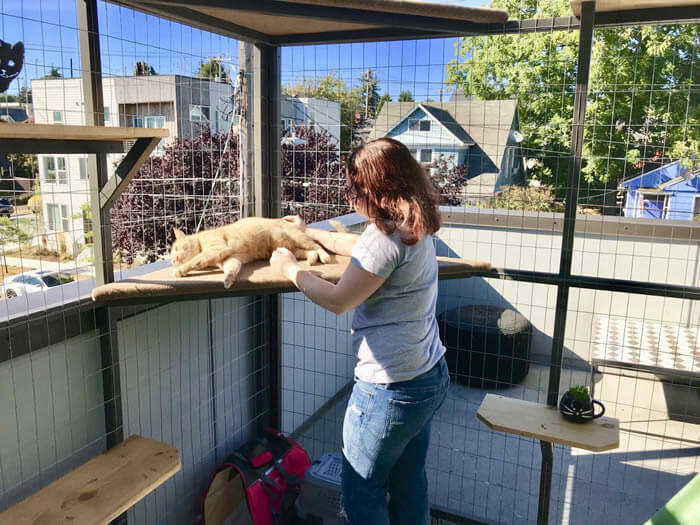 With very little yard space at their townhouse in Seattle, we transformed the third-floor deck into a catio paradise. A top floor view of the deck catio designed to complement the architecture. 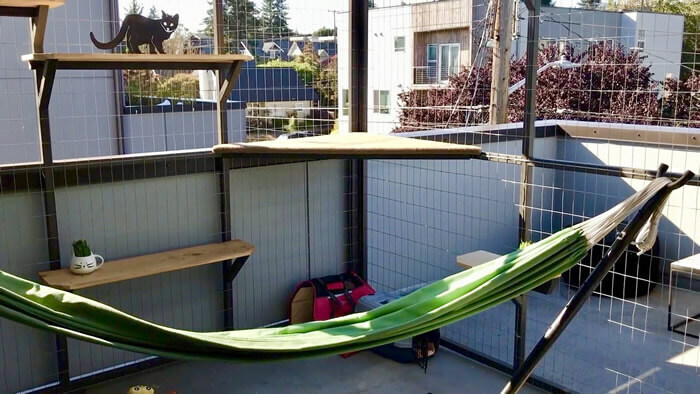 The spacious 8×8 catio blends in with the rooftop and surrounding townhomes and offers a place for Tamar and her cats to enjoy lounging in a hammock and several shelves provide opportunities for exercise. There’s plenty of enrichment including cat grass, cubbies and toys for a purrfect afternoon. The catio features a clear, polycarbonate roof for year-round enjoyment and a human-size door allows Tamar access to an uncovered, cat-free zone outside the catio for entertaining guests and territorial views. A cozy hammock for an afternoon cuddle with the affectionate Willow. A veteran cat mom, after Tamar’s elderly cats passed at the ages of 15 and 14, she adopted Dorian and Willow, who she nicknamed her Ginger Twins. Dorian is a short hair ginger and his sister Willow is a short hair, ginger bob tailed play hog. The first to greet guests, Dorian is friendly and extra affectionate when it’s time to eat while Willow’s always cuddly and energetic. Previously indoor-only, this is their first time in the great catio outdoors! Dorian, one of the Ginger Twins, poses for the camera in his catio. Tamar: My cats always liked to sit at the window and look outside, especially when I had it open and fresh air came in. I wanted to give them more access to the outdoors and fresh air as well as their own space to play and hang out in. CS: How has your life changed since having a catio? Tamar: It makes me happy seeing my cats relaxing and bird watching while safe outdoors. They definitely love it and spend the better part of the day in their catio. CS: How are the cats acclimating to catio life? Favorite spots, time of day, moments in catio? Tamar: They like to be there at different times of the day, and also check things out at night. They were really curious about the rain when we finally had some last week – the covered roof allows them to enjoy the catio all year long! 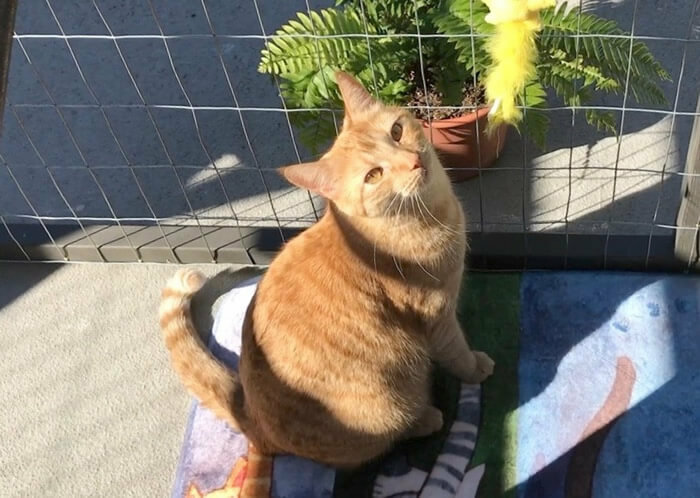 Tamar enjoys catio time with sun-loving Dorian. 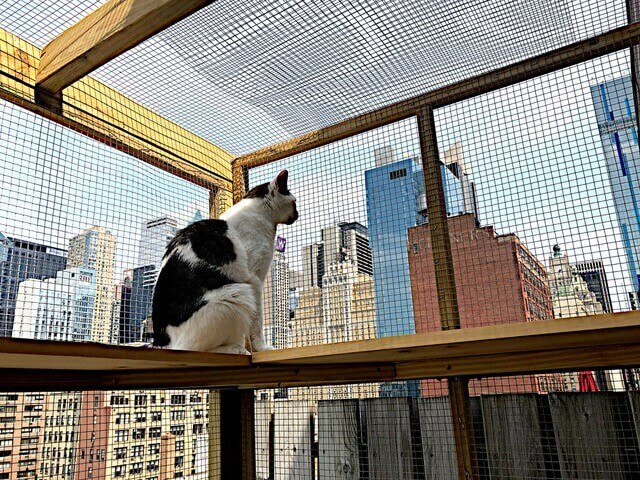 City living doesn’t have to prohibit cats from safely enjoying the outdoors and there are many ways to create a catio in small or above-ground living spaces. I am so thankful to DIY’er Paula, Christina, Kevin, and Tamar for letting us create their urban catios and share their stories. 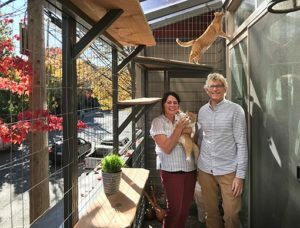 It’s always rewarding to see kitties and cat parents enjoying the many benefits of a catio. Whether a DIY catio plan or a custom project, it’s a joy to create spaces for the well-being of my 4-legged fur clients. If you’re a Seattle local and want us to design and build a complementary catio for your home, you can find more information here and get in contact. 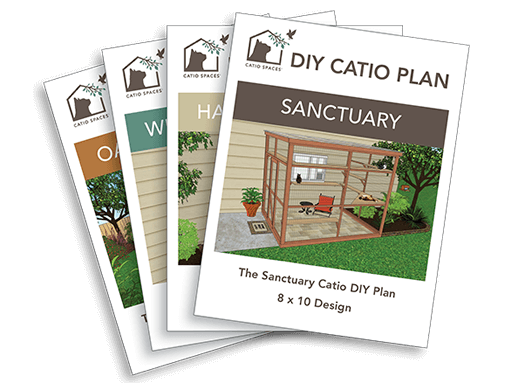 If you live outside the Seattle area, consider one of our downloadable DIY catio plans. The plans come in a variety of designs and sizes for a window, deck, patio or yard for all types of homes. You can build one yourself or hire a local carpenter to build our plans for you. We even offer free tips to create the purrfect outdoor haven for you and your cats to enjoy all year long. Thanks again to all the cat parents for entrusting Catio Spaces to design and build your catios. And, as always, life is good in a catio!